Anti-theft tags contain a tiny mechanical oscillator that is activated by a magnetic field. The detectors at a shop's doorway can detect the oscillation magnetically. The tag can be activated and deactivated by magnetizing or demagnetizing it, respectively. This liquid nitrogen generator uses a Stirling-cycle cryocooler that was pulled from a cellular phone tower. It was used to cool a superconducting RF filter that aids cell communications. The cryocooler is able to pump enough heat away from its cold end that air will liquify and drip into a vacuum flask for storage. I'd like to thank my Pateron supporters by offering a reward for those who donate at the $3/video level or higher. I'll send you an iron-on Applied Science logo that you can apply to your own lab coat or other clothing. 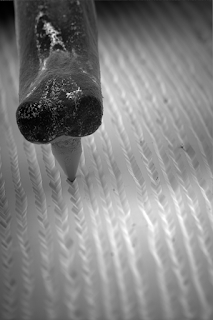 I describe how I made a stop motion animation of a phonograph needle in an LP groove using an electron microscope. 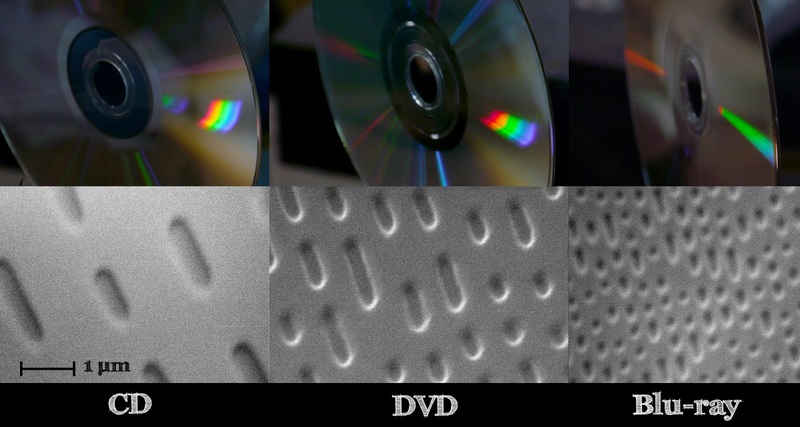 I also show electron micrographs of other recording media. 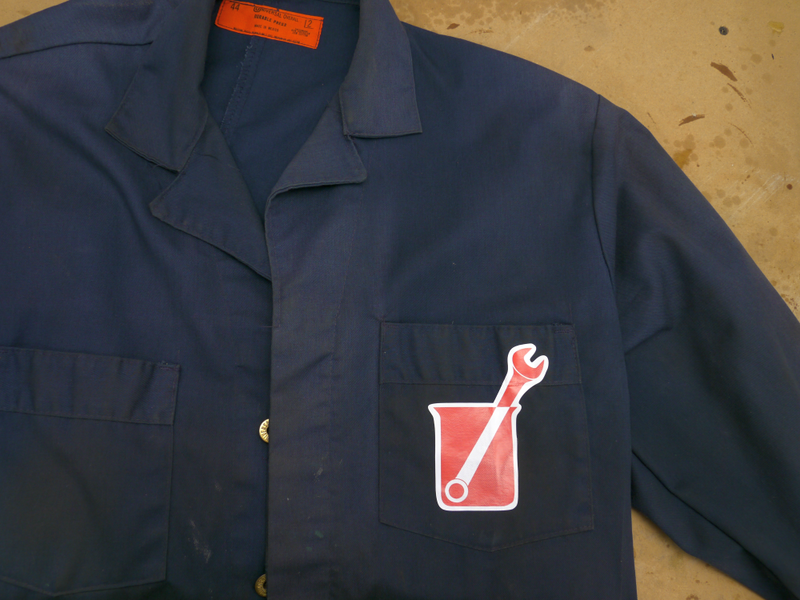 I explain how a jet of air can float a common screwdriver. As a follow-up to my previous video on bending wood, I show how ammonia can shrink paper money. The money is dipped into liquid anhydrous ammonia, then dried, and the process is repeated about a dozen times. As the money dries, it shrinks due to the surface tension of the boiling/evaporating ammonia. Bending wood with ammonia is not really DIY, but I show the process, which is extremely effective. There is also a commercial product that is pre-treated flexible wood, which hardens after being clamped in the desired shape. Hmm, it seems the product may no longer be available -- I can't find it at Inventables. I have a few upcoming projects that require anhydrous ammonia. In this video, I show how to distill it from "ammonia water" similar to common glass cleaner. The VirtualBench is an all-in-one piece of electronic test gear that combines an oscilloscope, logic analyzer, function generator, DMM, triple output programmable power supply, and an 8-channel digital I/O bus. It can be controlled with a dedicated NI app, or programmatically controlled with LabView or C. I show the device's usage and duggest which situations may benefit from using this device. The surface tension of water and the evaporation of ethanol produce an interesting effect in a wineglass known as "tears" or "legs". The process is caused by the Marangoni effect, which explains how toy soap boats work among other interesting things. I present some of my favorite tools and techniques from the workshop. I built a tiny radio into a ballpoint pen that allows the user to hear audio by casually biting the pen. A horn-shaped speaker is louder than an equivalent speaker without the horn. This fact doesn't violate physics because the horn is acting as a matching device between the speaker and the air around it.